Happy Friday! Are you doing anything fun this weekend? I am meeting up with a few of the #BWB girls to have a polish play date. How fun is that? 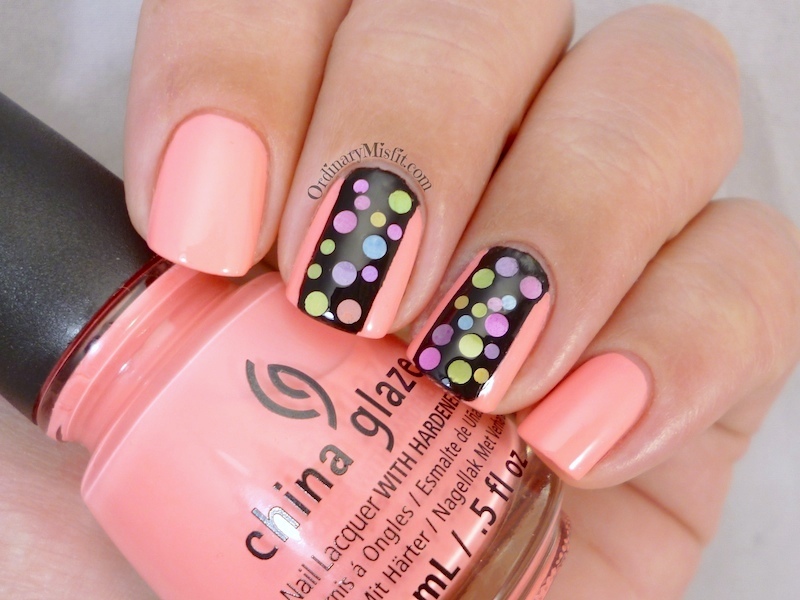 Here I started with 2 coats of China Glaze – Neon & on & on on all my nails. Neon & on & on is a bright neon pink that leans coral. As you can see my photo is not colour accurate at all. It’s bad enough this is neon but it’s also pink and my camera hates pink. I will have a swatch of just Neon & on & on later in the post but if you want to see what this polish really looks like have a look at Very Emily’s swatch here. Once that was completely dry I taped off my middle and ring finger so the strip down the middle was exposed. I then used Sinful Colors – Black on black to the black stripe down the middle. I removed the tape immediately after painting and before moving on to the next finger. Again, I could do with a little work on my straight lines 😛 Once the black polish was dry I went over it with non quick drying topcoat and placed the loose glitter from Born Pretty Store over the black polish. Once that was done I top coated everything and voila, done! This is Neon & on & on on it’s own and again, it isn’t accurate. This is a super bright neon (pastel) pink with coral tones. The brightness makes my camera completely freak out 😛 This is 2 coats with no topcoat. I am obsessed with this colour. It is the perfect summer neon pink. What do you think? Which one do you like better? Are you also ready for summer to return? I don’t mind the winter weather but I am itching to see bright and summery colours everywhere. I really liked the jelly sandwich effect but the colours of the glitter just pops more over black 😀 Both very cute, anyway. And uggh my camera hates pink too, it’s so annoying! Thanks so much. I also think they pop much more on the black. Thanks Lesley, it is was so much fun!